Over the course of his lifetime, Milbourne Christopher became one of the most prominent magicians in America. His performances, lectures, books, and articles placed him in the vanguard of scholarly conjurers who knew the history of magic from earliest times. He contributed countless articles to both magic and non-magic publications including Esquire and the New York Times Magazine. he literally defined magic for reference publications including the Encyclopedia Americana and Funk and Wagnall's Standard Reference Encyclopedia. His vast output of written magic routines and creative new tricks and inventions such as Forgetful Freddy and his Doves to Duck, are still performed by magicians today. He received honors and accolades from many organizations and is especially remembered for his slefless dedication to the Society of American Magicians, for whom he served as National President. His editorship of magic publications like M-U-M, Magicol and Hugard's Magic Monthly are also part of his remarkably productive life. 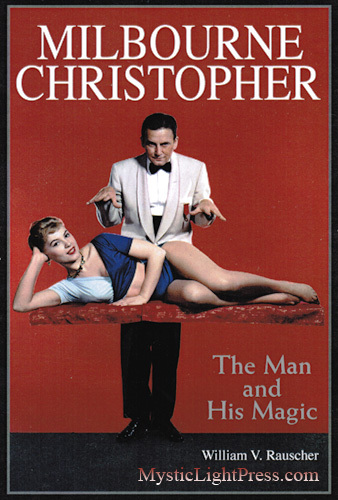 Christopher's appearances on all the major talk shows of his time, his TV specials that brought magic to millions, his travels around the world, his books on Houdini, and especially his biography of the escape artist, made him an important figure in the magic world, society and in theater history. During his lifetime, he also assembled one of the world's largest private collections of magic memorabilia. This book is the story of his life, his accomplishments, and his legacy. He was, as the Baltimore Sun called him, "a topflight man of mystification." Suave, handsome, well-spoken, educated, quiet and calm in demeanor, he conjured for the best audiences both on state and in intimate settings. He was well organized, committed to his calling, and above all, a gentleman. In this account of his life beginning with his birth in 1914, the author covers his many achievements, and especially his contributions from the 1930's to the 1970's, up until his death in 1984.
and memorabilia. $125 + above postage fees.